On Saturday, November 5th, 2011 a Ceremony of Remembrance will be hosted by the Menorcan Cultural Society in memory of those buried in the Tolomato Cemetery. We will gather at the gate of the Cemetery at 9:30 am and process together to the Chapel of Father Varela where a Mass will be celebrated by Reverend Edward Booth, of the Cathedral Basilica at 10:00 am. Everyone is invited to wear period dress. After Mass, Father will bless the grave sites. On Saturday, March 10th, 2012, the annual Menorcan Heritage Celebration will be held in the courtyard of the Llambias House, located at 31 St. Francis Street in St. Augustine hosted by the Menorcan Cultural Society. Featured will be pilau, Menorcan Clam Chowder, baked goods and Menorcan pastries and of course Fromajadas. Sally Walton will have dancers to entertain and Herb Greenleaf will be there with Menorcan family stories. Michelle Reyna will be there to sing some Menorcan songs. Datil pepper jelly, sauce and vinegar will be available also. Again this year there will be displays of Menorcan family photographs, archaeological artifacts from the Menorcan years as well as displays highlighting Menorcan activities over the years. So be sure and mark your calendars and join us! Mentioned in our last newsletter, the Menorcan Society is raising money to have the statue of Father Pedro Camps cleaned as our contribution to the 450th Anniversary of the City of St. Augustine, which officially takes place in 2015. 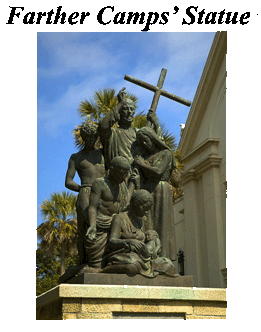 The Statue is located in the west courtyard of the Cathedral Basilica of St. Augustine. It was placed there in the mid 1970s by X. L. Pellicer, Sr., a descendant of Francisco Pellicer, and Dr. Fernando Rubio, of Menorca, as a tribute to the Menorcans who survived the colony. The cost to clean and restore the statue will be around $7,000. Enclosed with our newsletter you will find a letter of support from Father Thomas Willis, the pastor of the Cathedral Basilica. In his letter, Father describes the condition of the statue. Through the generosity of some of our members we have raised around $2,000 towards the statue cleaning. We need the help of the rest of our members to make this happen. Father Camps statue is one of the few things you will find here in St. Augustine that points toward the important part the Menorcans played in the history of Florida. It is the only statue of Father Camps and our people that exists except a smaller one that is located on the island of Menorca. Times are tough for all of us, but won’t you help us accomplish this important task and help preserve our history? You can send donations to the Society’s address. Thank you. It is almost that time of the year. Again we will have the Menorcan Christmas Tree on display in the Visitor Information Center here in St. Augustine. The tree will be put in place after Thanksgiving. For those who are not familiar with our Christmas tree, we display a tree in the Center and decorate it with Menorcan photos. Thank you to all who have sent photos to me to place on the tree. But you still have time to send a photo or two of your family past and present. Just send them to me at 13 Saragossa St. St. Augustine, FL 32084. We continue to travel around giving talks about the Menorcans and bring awareness to those who have not heard about us. In July, a talk was given at the Beaches Historical Society in Jacksonville Beach. Members from St. Augustine were joined by members from the beaches area and Mayport. In September, the Society represented by officers and members took part in the Founders Day Celebration at the Mission of Nombre de Dios, in St. Augustine. Also in September, a talk was given at the Selva Marina Club in Atlantic Beach for the Long Time Newcomers Women Club. Coming up.. 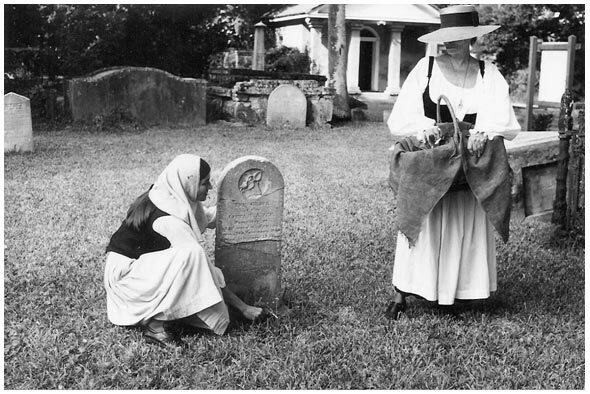 In October a talk will be given at the EWLI Women’s Club meeting in St. Augustine about the Menorcan Women. We had a new member, Lee Owen, join us for the annual Menorcan tour with the Spanish students exchange for the Sister Cities Association of St. Augustine. Two of the students from Spain had visited the island of Menorca previously. The students enjoyed their tour as much as we enjoyed being with them. The tour took place on July 19th. Dues are due in January. The dues are $12.00 a year. The dues enable us to hold the Celebration in March and mail Newsletters and notices. Thank you very much to those faithful members who mail their dues every year. There are still over 300 members who have not paid their dues in over 5 years or so. It sure would be a great help to the Society to have you help us by paying your dues and not leave it up to the usual 200 who do. Tee-Shirts Our Menorcan tee-shirts are not only available at the Celebration in March. You can contact Theresa Usina at (904) 824-5354 for information about the shirts anytime during the year. The St. Ambrose Fall Fair Several members of the Menorcan Society, who are members of the St. Ambrose Parish, sent out a call for assistance to have a table of Menorcan deserts for their fall fair. A day was spent making Fromajadas, Crispees and potato candy. The deserts were sold out by the end of the day and enjoyed by all. Information was given out to inform everyone about the story of Menorcans and Fromajadas. Next year they plan on increasing the types of deserts they offer. If anyone has special family deserts you are welcome to send them in and they will be included next year. A special thanks to members: Mary Ellen Masters, Sylvia Johns, Melinda Ausley, Joyce Segui Marwick and Mary Pacetti for their assistance.